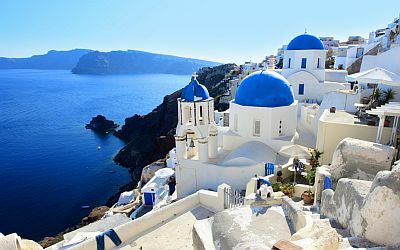 The climate of Santorini, the largest and southernmost of the Cyclades, is typically Mediterranean, with mild and rainy winters and warm and sunny summers. 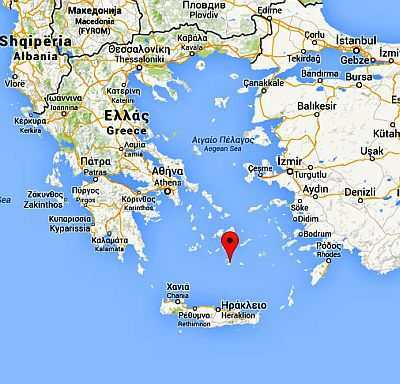 The Cyclades (which include islands like Delos, Mykonos, Paros and Ios) are located in the Aegean Sea. The rainfall pattern is typically Mediterranean, in fact the rains are concentrated in autumn and winter, in particular from October to March. In practice, it rains very rarely from April to September, and almost never in summer, from June to August. The length of the dry season makes the landscape arid. The interior is largely flat, but there is also a hill, Mount Profitis Ilias, 567 meters (1,860 feet) high. In the warm season, starting from May, the Cyclades (and therefore also Santorini) are particularly affected by the Meltemi, a wind that blows from the north, persistently and in periods lasting a few days. This wind is able to make the air feel cooler than it is, but it can be also annoying and make the sea rough. In winter, from December to mid-March, temperatures are generally mild, but waves of bad weather, with wind and rain, can not be excluded. Sometimes there can be cold days, with the north wind blowing, and maximum temperatures remaining below 10 °C (50 °F). In spring, from mid-March to May, the weather is mild, and it gradually becomes more stable, with rain becoming gradually less frequent. Summer, from June to mid-September, is warm and sunny. The wind almost always makes the heat bearable, although sometimes there can be some short heat waves of African origin. Autumn, from mid-September to November, is initially warm and sunny, but then the first rains occur, and with each passing week they become more frequent. In autumn, there may be many sunny days, but the rains in this season can sometimes be abundant. The amount of sunshine in Santorini is great in summer, when clear skies are the norm. In winter, periods of bad weather, with cloudy skies, alternate with sunny periods. The sea is warm enough for swimming from July to September, reaching a maximum of 24 °C (75 °F) in August; therefore, it is not very warm, but it is acceptable. The best time for a beach holiday in Santorini is the summer, from June to mid-September. Those who are sensitive to cold can bring a sweatshirt, also in midsummer, for windy and cool evenings. In spring and autumn, especially in April and May and from mid-September to mid-October, you will find pleasant temperatures, and the weather will be often sunny, although there can be also some short periods of bad weather.